Steak and lobster is a match made in heaven. While the combination of steak and lobster is incredibly indulgent, our Surf and Turf is a delicious choice for a special meal you can enjoy anytime. 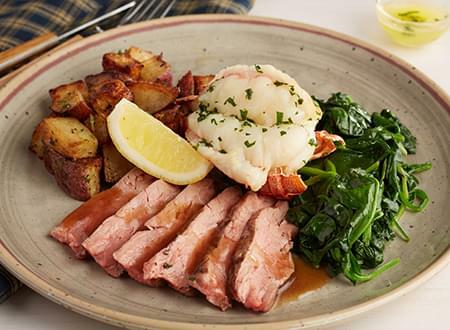 We pair our sweet, succulent 3 oz lobster tails with 4 oz of Flank Steak. Served with clarified butter and flavorful beef gravy. BEEF FLANK STEAK, SPINY LOBSTER, WATER, BUTTER, BASE BEEF, RED WINE, ULTRA SPERCE MAIZE, ONION, GARLIC POWDER, SUNFLOWER OIL, BLACK PEPPER, BEEF BASE, WORCESTERSHIRE SAUCE, KITCHEN BOUQUET. Remove both Lobster and Steak from tray and heat both sauces and side dishes according to instructions for 2:00 minutes. Check temperature and heat in additional 30 second increments until at least 160 degrees. Gently heat Lobster and Flank Steak until just slightly above room temperature and pour HOT Clarified butter over Lobster tail and HOT beef sauce over flank steak.